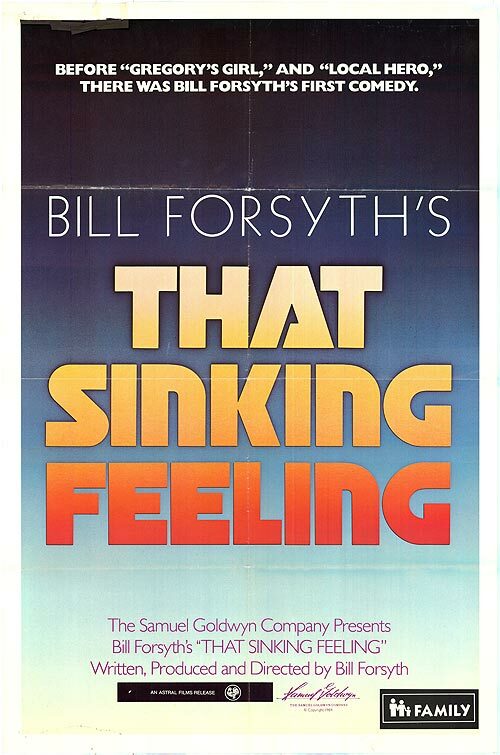 1979’s “That Sinking Feeling”: The Very Charming and Overlooked First Film Of Director Bill Forsyth – LILY & GENEROSO 4EVER! By 1984, Scottish director Bill Forsyth was getting quite a bit of notice here in the States. His second film released here in 1981, was a painfully funny and sweet coming of age story called “Gregory’s Girl,” which achieved critical, if not commercial success. Local Hero, his second film, and an art house favorite from 1983 starring Burt Lancaster, remains one of the classic quirky, dry comedies of that decade. So, in 1984, I, like so many other fans of his work were wondering…What was Bill Forsyth’s debut film like? Much to my delight, a limited release of “That Sinking Feeling” premiered in Philadelphia in 1984 at Sansom Street’s Roxy Theater, which meant I immediately had to go see it after school that Friday. “That Sinking Feeling” begins with the tagline, “The action of this film takes place in a fictitious town called Glasgow. Any resemblance to any real city called Glasgow is purely coincidental.” Truly, Glasgow seems a dreary, sad place in the late 1970s or at least the “Glasgow” depicted by our Mr. Forsyth, as our hero Ronnie (played by Robert Buchanan who would later portray Gregory’s close friend in Gregory’s Girl) is quite down about his inhabitance of this particular “Glasgow.” So much so, that he tries to commit suicide by drowning himself (with a bowl of cornflakes of course) which after he fails in achieving that small task, propels him into the idea that there might be another way out. He proposes to his friends Vic and Wal the idea of a burglary involving the theft of many stainless steel sinks to bring in much needed cash. They are so broke that even the paltry sum of 45 pence for a burger and coffee seem galaxies out of their grasp. In the formation of their master plan is the gathering of their crew, most specifically their friend Bobby, who will make a drug that will allow them to obtain a vehicle for their crime and a little boy called the “Wee Man.” The plot saunters forward with the usual quirky pace of any Forsyth film, allowing you to pick up the odd character or two with the plot almost becoming secondary to the small moments that Forsyth does so brilliantly in later films. The red jogger who comes through scene after scene without any backstory or explanation is reminiscent of the phantom dirt bike racer in “Local Hero” who seems to appear just to remind the viewer that there is a reality of some sort existing outside of Forsyth’s lackadaisical but always entertaining plot. Though only given a small release back in 1984, one has to wonder if a young Wes Anderson had watched this film as he was writing “Bottle Rocket,” Wes’s debut film. “Bottle Rocket” is also the story of a group of hapless, lost young people who are using crime as a means of escape. Though “That Sinking Feeling’s” Ronnie, Vic, and Wal kind of need the money a bit more than just something to give them an identity, it still means a same outcome in terms of a good laugh at a group of likable boys who are trying to escape their youth by going for whatever they can steal. Love That Sinking Feeling…insightful take on it Generoso!